St. Mary’s Wilderness is in the George Washington National Forest in Augusta County. St. Mary’s River, a small river that is better characterized as a large creek, empties a large drainage area on the west slopes of the Blue Ridge Mountains. It’s about three hours from Abingdon via I-81. In fact, it’s as close to Washington, DC and Richmond as it is to Abingdon. In April 2011 I hiked and did some trail running up the main St. Mary’s “trail”—if you would call it that—on a weekend trip to the Shenandoah Valley. The last time prior to this that I hiked in the St. Mary’s Wilderness was as a student and member of the Washington & Lee University Outing Club in the late 1980s. Unlike most hiking areas, St. Mary’s Wilderness has become more inaccessible since my trips there when I was in college. There is a sign at the entrance to St. Mary’s Wilderness that states that the trail was destroyed during Hurricane Katrina in 2005. There was a well-established trail prior to the hurricane. Now it starts out as a trail but within a half-mile deteriorates to sporadic rocky areas and only remnants of a trail. There are numerous areas where the “trail” is blocked by blow-downed trees, and where the trail meanders or peters out and then reappears several hundred feet further along the river. The trail also runs along some embankment areas that are somewhat dangerous, requiring hand-holds on tree branches. This trail could be challenging with a large, heavy pack for these reasons. Due to limited time, I was only able to get several miles up the trail, so I cannot comment on the further reaches of the trail. However, the lower areas are not in very good condition. In fact, the conditions were so poor that I carefully retraced my hike back to the entrance parking lot, to make sure that I had not missed the trail somehow. Considering that this was early in the season, with the leaves not fully out and the underbrush not obscuring the trail, I do not think was this the case. The St. Marys River is purportedly a good trout fishery. 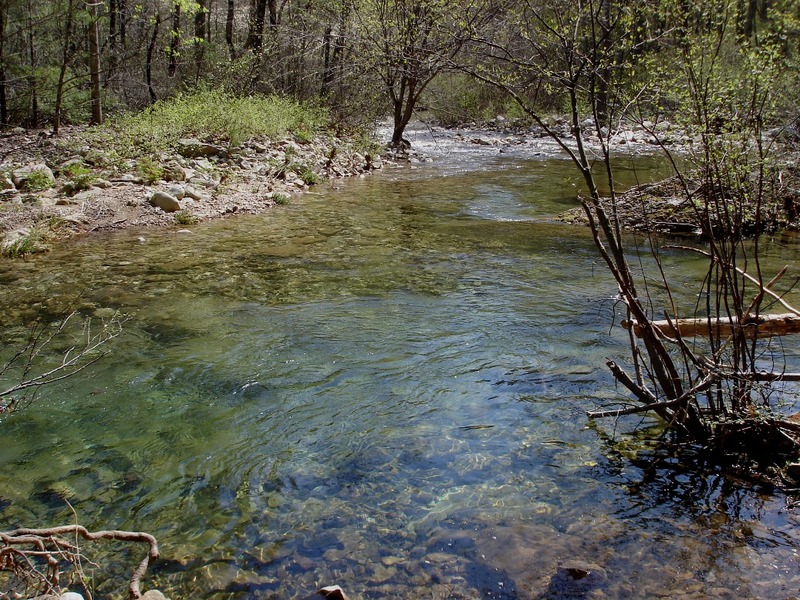 The river is not part of Virginia Department of Game and Inland Fisheries’ stocking program, however it is a designated special regulation trout water. Only single hook artificial lures may be used; no bait may in possession of the angler; and all trout less than the minimum—for St. Mary’s River, a 9-inch minimum—must be released. 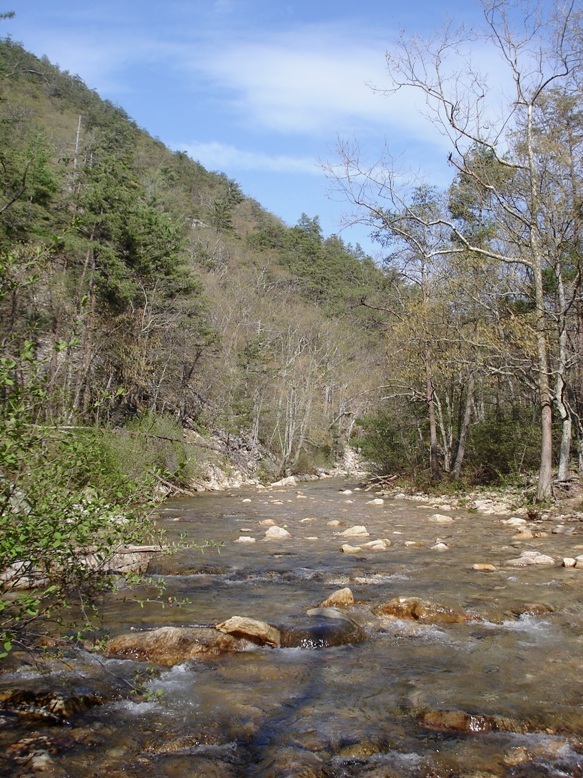 Although designated as a wilderness, it is not remote compared to many areas of national forest southwest of Roanoke in the Abingdon area such as the Mount Rogers National Recreation Area, parts of the Clinch Mountain Ranger District, or the Cherokee National Forest in Upper East Tennessee. St. Mary’s Wilderness is nonetheless remarkable for being such a large, contiguous wilderness area so close to the major metropolitan areas of Virginia. Here are some additional thumbnail photos of the St. Mary’s Wilderness. Click to enlarge them.